Speech delivered by NDM President Peter Townsend at the Kiwanis Club, North St. Andrew, February 20, 2014. 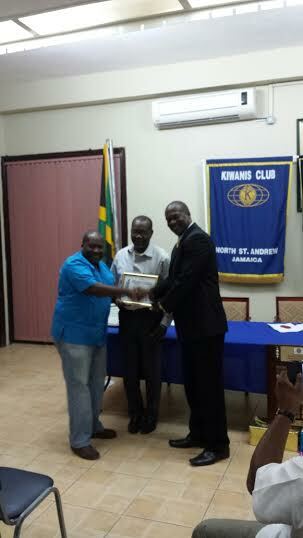 Thank you for introducing me tonight at this meeting of this august institution, the Kiwanis Club, North St. Andrew. Vice Presidents, Officers & Members of the North St. Andrew Kiwanis Club, ladies and gentlemen, boys and girls, friends, my fellow Jamaicans all, good evening. First of all let me thank you for inviting me to speak to you tonight as this prestigious club celebrates 40 years of existence, for which I congratulate you and salute all members, past and present who have served; Secondly I want to introduce you to a few of my colleagues from the National Democratic Movement, in the audience, attending your meeting with me tonight. It is indeed an honor to be among patriots and servants like you tonight. Servants committed to the service of your fellow human beings. We could all chose to live our lives for ourselves alone ….. Trying to get ahead in these difficult times, but not so, say you Kiwanians! You have chosen a life of service to our community, and to our children, and the lives of many, many Jamaicans are enriched by your selflessness. Service to each other, through our parents, our families, friends, church, school, volunteer and service clubs like Kiwanis, trade unions, various associations, community centers, and in many other ways that individuals have invented just to give to their fellow man – is a very significant and important thing. It is THIS giving, that makes each of our lives what it is today and we are all better off because of it. Let us just imagine for a moment, a society in which our individual and collective giving stops or reduces drastically. You and I would not want to live in such a place and we would not want our children to live there either – because such a place has no future. Every Jamaican has been the recipient of the selfless giving of many who have been here before us……..From our parents to our National Heroes, and many others, too numerous to mention. It was their intention, their dream that our lives would be better, much better, than what they experienced. I question – whether we have made the best use of the opportunities they created for us…..
—whether we have taken their sacrifices for granted…..
Has our generation dropped the baton by allowing a FEW, to lead us where WE, the majority, do NOT want to go?! Are we happy with where we are as a country, 70 years into internal self government and 52 years after political independence? Do you think that Bustamante and Norman Manley would be proud with where our country has reached today? I certainly am not! I remember when the Jamaican dollar was stronger than the US dollar! Why is it that some Caribbean countries still have strong currencies while ours is still sliding? I am alarmed at the rapid erosion of good governance and good order expected of civilized societies. Jamaica ranks some 83rd out of 177 countries on the Global Corruption Perception Index (which means we are seen as very corrupt). Do you know the story about cooking a frog alive? Do you know how to cook a frog? (Not that you would want to do so now for after all, some of us can still afford chicken). (LOL) …But then again frog legs are delicacies in some cultures. Anyway, if you throw a frog into a pot of boiling water it would leap from that pot immediately upon its legs hitting the surface of that hot water at boiling point, because the temperature would be too suddenly and blatantly uncomfortable and unbearable. s-l-o-w flame, before he knows it the water changes temperature without the frog noticing the high temperatures to which the water is climbing until it reaches and exceed boiling point and the poor frog is cooked in his squat. My fellow Jamaicans, are we being cooked so slowly that we do not even recognize the clear and present dangers and the shaky future we are creating for ourselves, our children and grand children? All these things have happened slowly, overtime and now we are at a point where we seem incapable of being shocked or outraged anymore. And most of us are numbed into inaction. Are we confident about a prosperous future? And I’m talking about prosperity for all and not just the greedy and selfish few who are comfortable with immoral or illegal gain? Do you expect us to achieve the much talked about so-called “VISION 2030 with the current type of leadership and work ethics? If you believe in tooth fairies then you may believe that too. When we look at where we are coming from (in relation to other Caribbean or Commonwealth countries). Up to the late 1960s Jamaica was heralded as the fastest growing economy in the world…..With Singapore behind us in second place. Back in early 1960s the Jamaican government pulled us out of the W.I. Federation on the grounds that the other islands like TnT, Barbados, etc were holding us back and would be a drag on us. Today Singapore is First World, TNT/BDos keep us at arms length and laugh at us while flooding our supermarkets with their goods. And all we do is cry foul, complain and threaten to boycott their products. How did we come to this? Have we no shame? Why are we here and they at a better place?? Are they brighter than us? Are they more resilient? are they stronger? Are they more creative? Are they more talented? Do they have more natural resources? No! ……. the Cayman Islands, Singapore and the Bahamas are not as blessed with natural resources as Jamaica! But you know, there are some African country which are rich in oil, gold, diamond, copper, etc, but yet due to selfish, bad leadership they remain 3rd world countries. Yet countries like Singapore and the Bahamas, are so well off. So what is it then that makes a country rich? I put it to you that it is the people-the Human resources – that makes a country prosper! But it still needs more: It is what we do, how we do it, the choices we make, the quality of our leadership, the vigilance and participation of the followership, .ie., you & me & everyone else. Thus followership is just as important as leadership. If we neglect this important service, to participate in the affairs of our own nation, we would have dropped the baton that was handed to us by our parents who shed blood, sweat, & tears and then we would leave the next generation to pick up the pieces or worse, the ashes of what we leave behind. Have we no shame?! We are better than this! -we have pedigree! – we are descendants of brave people, who did not accept slavery or oppression of any kind,-from people who considered themselves superior- and was a law unto themselves! Is it possible that history is repeating itself ?…Where individuals who consider themselves to be superior are trying to dominate and oppress the majority? Others spoke very strongly about change, and being different, but when they got into power, did the very same things! Jamaica’s positive achievements and excellence on the international, stage attained by our Track & Field Athletes, our Netballers, our Footballers, Cricketers, Paralympians, our Musicians and other cultural icons, our scientists, our academics and entrepreneurs is only a tip of the iceberg of the greatness of our people and what we could achieve if we set our minds to it. [Marcus Garvey had to leave Jamaica to continue his political career after he was vilified and rejected here…but was such a resounding success in the US, that he made it into the Black History Hall of Fame]. With such enormous human resource potential how come we have collectively ( tacitly and overtly) allowed our leaders to squander our chances over most of the last 52 – particularly over the last quarter century? Corruption costs this country tens of billions of $$ and it permeates the land and has deeply penetrated the society from top to bottom. Good governance is at an all time low. Political Garrisons have bred and spawned criminality and made us poorer and pushed this once safe and peaceful country into becoming a murder capital of the World, killing our people at a rate of a country at civil war; while abuses by agents of the state run rampant upon the land. The majority of Jamaicans have lost hope- and replaced it with apathy. Most people do not believe in the current system- Less than 50% turned out in the last elections -and that figure gets even less when you consider those who didn’t even bother to enumerate. But, notwithstanding the many challenges, we can still build a great wealthy nation. It is full time! – You and I, are who we have been waiting for. This is a call to action! if not now- when? If not us- who? Rosa Parkes in the 1950s …One Woman!……changed the trajectory of America and paved the way for MLK, Andrew Young, Colin Powell, Ron Brown, Condi Rice, and finally Barak Obama to be President of the world’s Super Power today…by her refusal to give up her seat on the bus to a white man. So, it is BOLD but seemingly small actions like Rosa Parkes’ by refusing to accept the status quo, that can lead to tremendous change which results in a totally different future. Together, you and I , and all who believe that we deserve better, can take back our country and our future if we are prepared to make bold moves. I am one Jamaican who have always participated in the civic affairs of my country and during the 1980s I voted for one party in one election and in a subsequent election I voted for the other. However by the end of that decade I became disgusted, turned off and alienated because of the destructive path down which both parties took this country of ours …..and I joined the ranks of the uncommitted. In 1995 out of curiosity and with some amount of cynicism, I went to the launch of a new political organization, the birth of the National Democratic Movement), and I was pleasantly surprised to find that we had shared beliefs about how to restore Jamaica to the path of honour and transform it into a safe, just, and prosperous society with equal opportunities for all our people. What are these shared principles and beliefs? – I believe in effective separation of powers for better checks and balances; transparency and accountability; in short– better governance. – I believe that our police should operate independent of political interferance – with a Commissioner appointed by and accountable to the Parliament – Not a Minister – which will be free to investigate and pursue lawbreakers regardless of who they are or where they are. Our laws should apply to everyone and not only be a shackle to some, while others plunder us and go free! – I believe that we should Repair our justice system so that it works for all and in a timely manner, because justice delayed is justice denied. – I believe that we should Reform the taxation system and ease the burden off the backs of PAYE workers and compliant property taxpayers. – I truly believe that it is a travesty that Jamaica and its people are endowed with such beauty yet we have one of the ugliest politics in the world. But if you had a power outage in your office one night would you prefer to sit and curse the dark or light a candle? We are now standing on the brink of a real decisive moment for Jamaica and we are offering you the National Democratic Movement as a vehicle of unity and visionary leadership for transformation. Everyone is being called to action! We (i.e. you & I ) are who we have been waiting for. The time is now! If you have a vision then now is the time to act. This, my fellow patriotic Jamaicans, is the moment of truth. To quote Vance Havner: “The vision must be followed by the venture….it is time to stop staring up the steps….. It’s time to start stepping up the stairs”. Become a part of the Movement of change and be an agent of change. Let us SAVE JAMAICA. …..NOT for ourselves alone, but for our children and children’s children. My vision is for us all to be healthy, safe and have the opportunity to be the best we can be, living to our natural lifespan, whatever that may be, in a just and caring society. We want to be our brother’s keepers and care for the weak, the mentally ill, the poor and the homeless and vulnerable-because we are all poor when our brothers and sisters exists in inhumane conditions. This need not be just a dream, it is very possible, others have done it and we can,…….….. and must……. bring this to reality. I do believe that our best days are yet to come but we – you and I and all of us – must rise up and take charge and change the political system and return our country to a path of trust, integrity and honour. Thank YOU! And may GOD stay by YOU as all of us join hands and build a better Jamaica, land we love.